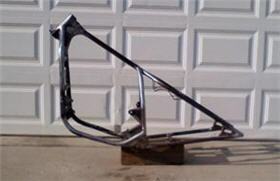 Free Motorcycle Frame Building Course! In this Free 9-part email course motorcycle frame building course called, "9 Problems Metalworkers Face When Building A Chopper Frame And How To Overcome Them", you'll get insider tips and solutions to the most common and frustrating frame building problems. Thank you very much for the schooling on the motorcycle frame building and welding. I did get all of the exercises and it was a huge help! I attached a picture of my bike along with is email to show you how everything came along once again thank you. Please send me more lessons so I can learn as much as I can with these lessons. I found the Custom Choppers Guide site and immediately bought the downloadable chopper handbooks. After pouring over all the information and getting the free mini course in my email, I knew this was definitely something I wanted to pursue. I think the information on getting the title and vin was extremely helpful. The blueprints are truly a work of art. My wife already has plans to frame them so she can hang them on our living room walls! Thanks so much for the great customer service! I just wanted to say THANKS for all the extremely crucial information for a bike build! Hey brother, I am a certified Boiler Tube and Pipe welder/fitter of 20yrs. I have always wanted a Harley and have finally decided to build my own from scratch, starting with the frame. Your course is priceless as I am no stranger to fabrication, your course is superbly informative and right on time for me. I have been under the gun for the last couple of years and not making very much money so your course is saving my life. I need a project and this is it. Thank you so much and as soon as I have the money I will be ordering everything you offer. I only want to build my own chopper to start with but if I do it all from scratch I may be able to save enough money to offer my services to the public and hopefully get some business, but first I have to be comfortable with what I am doing and know that I am one of the best craftsmen in the field before I offer services to the public and your services are going to help me realize a life long dream at 48 yrs old, I think it is never too late to start something you love and wanted to do all your life.